Never know who is staying over for New Year’s? Waking up tomorrow morning to face hungry guests could be easier than you think with the perfect morning casseroles. They are easy to make; anyone can cook them. But, what is a casserole? It is from the French for “saucepan”. The casseroles today used are a modern invention. In the 18th century they consisted of rice that was pounded, pressed, and filled with a flavorful mixture of meats like chicken or sweetbreads. After the 1870s casseroles changed to what we make today. Common in most nations, they became more popular in America around the 1950s. New lightweight metal containers appeared on the market; the earthware containers then became a thing of the past. And, really, by the 1970s casseroles took on a less-than sophisticated image. Nevertheless, casseroles are the perfect dish when serving a hungry crowd. The following 2 recipes are usually served for breakfast or brunch and definitely great for busy holiday mornings!! Crumble sausage, fry and then drain off fat. Mix remaining ingredients and add sausage. Pour in greased casserole, cover and refrigerate overnight. Bake uncovered in a pre-heated 350 degree oven for 45 minutes until brown. It serves 4 and can be doubled. Fry sausage and drain off fat. Mix all ingredients except bread. Pour mixed ingredients over the bread. Bake in a pre-heated 350 degree oven for 40 to 60 minutes. Note: It can be made ahead of time and frozen. Make it your own and enjoy it!!! Just a couple of more days and 2010 will be here. Maybe a couple of resolutions. Keep it simple. I don’t get into celebrating the New Year that much. The times I have celebrated, have been a disappointment. I feel I have been taken advantage; outrageous prices, poor service, and mediocre food. Don’t get me wrong, I look forward to a New Year with anticipation. Just like I enjoy having Thanksgiving Dinner at home; the same goes for this last day of the year. In the past I have had people over for a simple dinner and conversation and have attended a Murder Mystery Party in two occasions. Those were a lot of fun. In character the whole night. But, there are a few events going on in the next few days that have sparked my interest. So, here they go. Cafe Sole – 44 Baltimore Ave., Rehoboth Beach. Tel. 302-227-7107. They would like to remind you that January is Hot Tea Month and National Soup Month. Their soup is made in-house and is always fresh and distinctive. They are holding a few specials – On Friday January 1st is their Annual Pajama Party Brunch. Wear yours if you dare!! Also in January they are offering every Friday – Prime Rib Dinner for $20.10 and every Saturday – Steak & Cake Dinner also for $20.10. (A steak and a crabcake). Cafe Sole will be closed from January 4th – 14th. The Cultured Pearl located on 301 Rehoboth Ave. Tel. 302-227-8493. Website www.culturedpearl.us, will like to announce that they will be starting in January their Noodle Night. There will be new noodle dishes, fried rice, Yakitori and Bento Boxes. Monday Nite Sushi will continue as well. Doggies at the Beach – Will be open all week including New Year’s Eve and Day. They are located on 18806 John J. Williams Highway, Rt. 24 at Family Dollar Plaza, off Rt. 1. Tel. 302-644-8200. For more info. visit their website www.doggiesatthebeach.com. Thursday, December 31st – Race. The Seashore Strider Running Club’s 7th Race Into the New Year – 5K & Youth Mile. Fins, Rehoboth Beach at 12:00 Noon. For info go to www.seashorestriders.com or contact Tim Bamforth at Tim@seashorestrider.com. Thursday, December 31st – New Year’s Eve Murder Mystery Dinner – 7 p.m. cocktails (cash bar) and 8 p.m. dinner. Rehoboth Beach Theatre of the Arts and Footlight Productions are calling you to challenge yourself and have a good time. There’s a murder afoot. Not everyone is who they seem to be. Location: 20 Baltimore Avenue in Rehoboth Beach. Tel. 302-227-7303. Website is www.rehobothbeachtheatre.com or e-mail info@rehobothbeachtheatre.com. Friday, January 1st – Penguin Swim at the Princess Royale Hotel located at 91st St. and the Ocean. Tel. 410-641-9678. Location: Oceanside North Ocean City (91st-146th) on the beach. Getting wet for a good cause. Looking forward to this annual dip into the chilly Atlantic Ocean to benefit the local hospital: Atlantic General. Registration is at Noon and the swim is at 1 p.m.
Friday, January 1st – City Hall – 301 Baltimore Ave., Tel. 410-289-8931. Oceanside Boardwalk/Inlet – Each year the Mayor and City Council offer this Open House as an opportunity to tour City Hall and offer their best wishes for the coming year. From 1 p.m. until 3 p.m.
Wednesday, December 30th – Cason Cottage Holiday Exhibit from 11 a.m. until 3 p.m. The Cason Cottage is located on 5 NE 1st St. $4.00 per person. Thursday, December 31st – Downtown Atlantic Avenue – From 4 p.m. until 12 a.m. bring the entire family to enjoy visual and performing arts in non-alcoholic venues at various locations. For more info. please call 561-279-1380, ext. 3. Thursday, January 7th – Jack Hanna at the Crest Theatre at Old School Square, 51 N. Swinton Ave., in Delray Beach. Contact Box Office 561-243-7922, ext. 1. You know him and he will be there in person. You have seen him on the Emmy award-winning nationally syndicated Jack Hanna’s into the Wild. He has appeared as guest in many t.v. shows. Tickets are $25 for general or $40 for reserved. You may purchase tickets on line, as well, by visiting http://www.oldschool.org/lectures.asp. In the past I have told you that all the beach towns, from Lewes to Ocean City, Maryland, are within driving distance from each other. Fenwick Island is a half way point for some of us that get together for dinner from time to time. Fenwick Island is right on the Maryland/Delaware line. One popular restaurant in this beach town is Nantuckets Restaurant. This restaurant has two seating options. You can choose to sit in their more formal rooms or you can choose the Tap Room. The Tap Room is the one I am going to be reviewing because I like it the best. Nantuckets is located on 601 Coastal Highway (Rt. 1), Fenwick Island, DE 19944. Tel. is 302-539-2607. 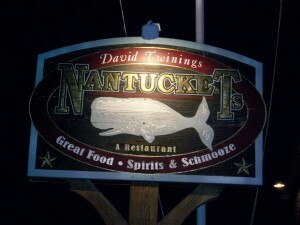 The website is www.nantucketsrestaurant.com. The e-mail address is info@nantucketsrestaurant.com. I have to be honest with you, but I really don’t think that often about this restaurant. I have had both good and o.k. meals in the past years. You might have a different opinion, but I have gone enough times that I can certainly say it. Remember, this review is my opinion only. It is in their Tap Room where I have had the best meals. I think that particular side of the restaurant is cozy, great for lite fare, even though you can get full entrees. And don’t worry because if you are a sport aficionado there are t.v.s to keep up with the scores. Definitely a room with atmosphere. Right before Christmas we met Ross and Cindi. It is becoming our annual Holiday dinner before it gets hectic. We have been getting the same table in the corner of the room. Full view of who is coming or going. We did not know they had a great special that day. I believe it was around $19 for a lot of their entrees. I was originally going to get their steak salad, which is, by the way, the best. Instead, I got the strip steak which was delicious. Cindi got the crab cakes, which Nantuckets is known for and Ross got chicken, which he raved about. My husband, on the other hand, decided to order the soft shell crabs. I would not have ordered them, because they are frozen this time of the year. He said they were o.k. We really did have a nice evening, and plenty of laughs, which are the nicest things about sharing meals with friends. Nantuckets has on-line shopping. Visit their website if you would like to order some of their specialties like the Quahog Chowdah, Lobster Mac N’ Cheese, Crab Cakes, Eastern Shore Crab Meat, and Maple Balsamic Vinaigrette. Chowdah?, Chowdeur? or Chowder? Anyway you say it will be fine and Nantuckets has a good one. Thick and rich. Another dish to try is their lobster claws. It is big enough for an entree. Tasty and sweet. The restaurant has the space for large parties. For more info. give them a call. Since 2009 is coming to an end, Nantuckets offers New Year’s Eve fare. And, if you go by 5:45 p.m. you will get $5.00 off. 4 tblsps. butter (or margarine) I like butter the best for this dish. Cook lobsters in boiling water for 10 minutes; remove and let cool. Remove lobster claws, crack and clean out meat; reserve. Split lobsters from head to tail; remove meat and all the “goodies”; add to reserved claw meat. Slice lobster and save. Note: To save time have your store steam the lobsters. Saute onions with thyme in 2 tblsps. of butter. Add sherry and reduce liquid by 1/2. Add cream and mustard; bring to a boil. Boil 1 minute; remove from heat and keep warm. Pat dry scallops and sautee them in remaining 2 tblsps. of butter for 4 minutes. Add lobster meat and cream sauce; mix well. Cook 3 minutes. Serve immediately over wild rice. Note: Please adjust this recipe to your liking and make it your own. Let me tell you about my Christmas Eve’s dinner. I figured that I could handle a small crowd of about 10 or so for that evening, so I invited a few friends. All in all, there were 11 of us and a few more that showed up and we loved including them, as well. When my children were younger I never had anyone over on Christmas Eve. It was just too hectic. The thought of having a relaxing evening where I could have everything pretty much made ahead of time was what I was trying to achieve. This is how it started. 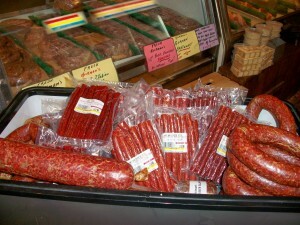 On December 22nd I marched myself into Hickman’s Meat Market. They have 2 locations, but the one that I went to is on Highway #1 (Coastal Highway), Rehoboth Beach, DE 19971. Tel. is 302-226-8345. 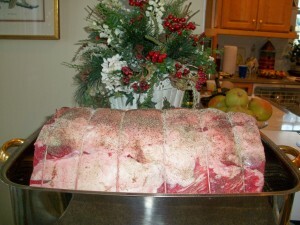 I wanted a rib roast for about 10 people. I thought I should get 8 ribs and Mr. Hickman thought I was nuts. I would be feeding people for some time with that many ribs. He thought that 4 ribs would be plenty. But not me because I know best, right? I told him I had big eaters and I would compromise with 5 ribs. The roast was 15 lbs. I could not help but take a picture. And, oh my gosh, thank goodness I had a pan big enough to fit that piece of meat!! It’s the 26 and we are still eating beef. Cooking the beef was an adventure. The method of cooking I used was the one where you place your beef at mid-day in the oven on a higher temperature for about one hour and then turn the oven off and leave it like that all day without opening the oven and before you get ready to eat you turn it back on and cook it for 50 minutes for medium/rare. So, everyone was having a great time; drinks, crabmeat courtesy of Shelley, oysters and shrimp courtesy of John and in the back of my mind all I was thinking was “I hope that meat is ready”. Well, it was not. It was raw. So, let’s go the convenction oven route for another 1/2 hour. Well, it was still too rare. Then Debbie, who came from Great Barrington for our beef extravaganza, took over. Knife came out and she started carving and slicing and I could tell the natives were getting restless, but, we put the sliced meat in the oven for a bit more and believe it or not it worked. It had a great taste and the salad and potatoes, sweet potatoes, curried fruit, veggies and ham also courtesy of Shelley were all very good. I learned that next time I will listen to my butcher. He knows best. And that method of cooking? It works but in a much smaller roast; 3 ribs. Hickman’s gives you such personal service. They have been voted Best in Delaware Today Magazine 5 years in a row. 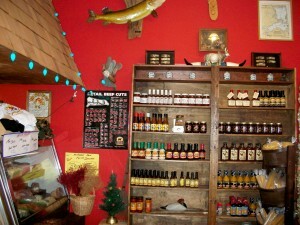 Hickman’s offers prime beef, award winning and famous hot stix and applewood smoked bacon from their own smokehouse. Their line of all natural fresh and smoked sausages, hand made by them is a combination of generations of family recipes, plus new ideas. 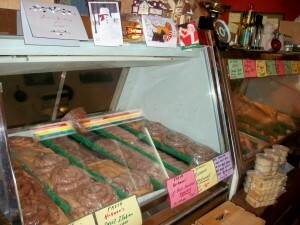 They also have gluten free sausages that are made to order. 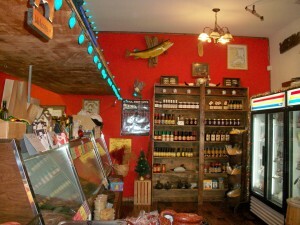 In their store you will find desserts to finish your meals. Some of the puddings are gluten free, as well. Sauces and dips, etc. are available. Mr. Hickman told me that his family started in the meat business in 1881 in the Eastern Shore. 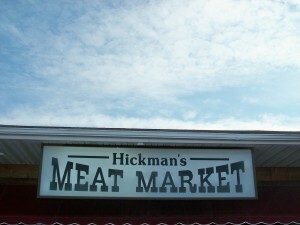 In the Hickman’s family, there are 31 relatives; all in the meat business. He gave me a list of all their meats and it really would take a lot of space to mention them all here. Some of their specialties are cured corn beef, farm raised rabbit, farm raised ostrich, frog legs, bacon burger, venison patties and steaks, jerky, spicy jerky, pepper shooters, stuffed bell peppers, hunters sausage, venison steam ship round, and venison boneless back strap. Please feel free to call them ahead and place your order for pick up. They also have shipping available. It really was so nice to talk to Mr. Hickman. He was so busy and had about 1,000 orders for rib roasts but he was gracious enough to tell me he was fixing my roast for easy carving. Thank God he was not here to see how we actually butchered that beautiful piece of meat. I have mentioned before that there is nothing better than the company of family and good friends to share a meal; on Christmas Eve that’s exactly what I found in my home. Hope your Christmas was nice and talk to you later…. I have had this poem for so long and many times I have sent it out on Christmas Eve. It is still current in today’s world. I hope you enjoy it. I want to wish you a very Merry Christmas and the best for 2010!! Y, para los que hablan Espanol, a ustedes les deseos unas Felices Pascuas y Salud y Prosperidad para el 2010. That Santa had better not use just a reindeer. Were replaced with 4 pigs, and you know that looked stupid!! His fur trimmed red suit was called “Unenlightened”. Nothing that clamored or made lots of noises. Again, Merry Christmas and Feliz Navidad. Note: This poem is copyright 1992 by Harvey Ehrlich and it is free to distribute. This was not my intended post tonight, but I was so cold that I started looking at some pictures I had taken some months ago in Delray Beach, Florida. Unless someone had pointed this out to me, who knows if I would have found it. It is one of those places that, to tell you the truth, I have not seen advertised that much when I am in Florida. 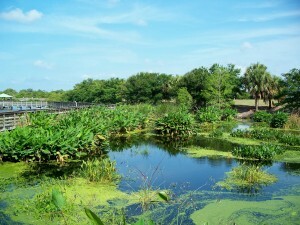 It is called Wakodahatchee Wetlands. This is a man made nature preseve full of birds and wildlife. So, just like we have in Delaware and Maryland beautiful State Parks, Palm Beach County has more than a few of these parks for everyone to enjoy. Excellent job!! When I first went to Wakodahatchee, it took me a little bit to find it since it is not well marked. 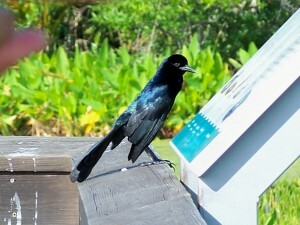 The location is considered suburban Delray Beach and it is located on the east side of Jog Road between Woolbright Rd. and Atlantic Ave. As I have mentioned before, Atlantic Ave. is the main street in Delray Beach. If you go west on Atlantic and cross over 95 then you need to continue to Jog Road and turn right. You will go through the Lake Ida intersection and Wakodahatchee will be not even 1/4 mile on your right. It is the southeast side of Palm Beach County Water Ulitity Department’s Southern Region Operations Center at 13026 Jog Rd. in Delray Beach. You see? It’s a little tricky. Pay attention after you go through that Lake Ida intersection. The website is http://www.pbcgov.com/waterutilities/wakodahatchee/location.htm. You should visit the website because it will give you all kinds of info. like what kinds of tours they offer, location’s map, explanation of what the nature preserve is all about and a virtual tour of the park. There is a telephone number for tour info. and that is 561-493-6000. 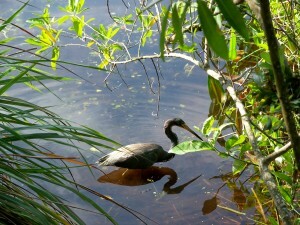 Wakodahatchee opens early in the morning and stays open until dusk. I found that it was so peaceful at the end of the day; you will experience the arrival of those magnificent birds at that time of the evening. 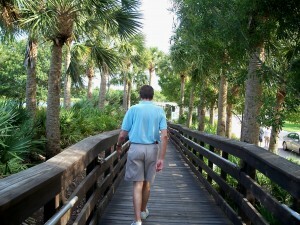 You can walk the 3/4 mile boardwalk, which winds through three of the wetland’s ponds. 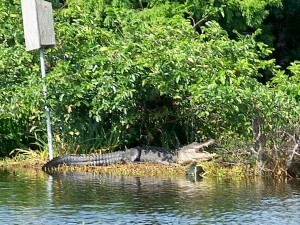 You might even be lucky to catch the site of a few large alligators, as well. 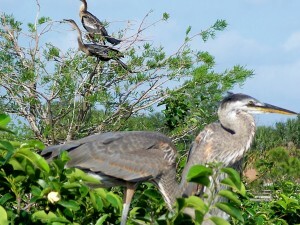 And, during certain months of the year you will get to see new birds come to life. Wakodahatchee comes from the Seminole Indian Language. It means “created waters”. These are 50 acres of unused utilities land that have been turned into a wetlands ecosystem. 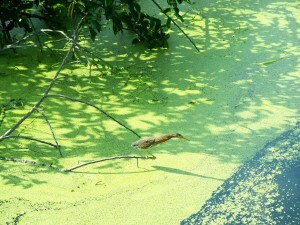 Wetlands provide a variety of important envirornmental functions. Just like the wetlands in Delaware and Maryland, the ones in Florida provide food and habitat for many important wildlife species. If you are in Palm Beach County, near Delray Beach, take a detour from the beaches and you will really enjoy Wakodahatchee. 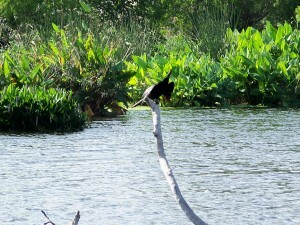 Note: There is another wetlands preserve called The Green Cay. It is located on 12800 Hagen Ranch Rd. It is between Boyton Beach Blvd. and Atlantic Ave. It is considered suburban Boyton Beach. It has also an elevated boardwalk. A little different than Wakodahatchee, but just as nice. 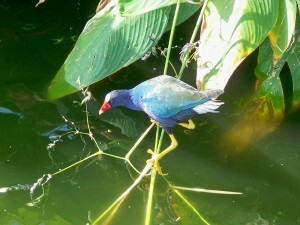 The next time I visit Florida I will get pictures and some more information for you to explore. If you are in Florida now, check it out. It is cold up north so enjoy the warm weather and outdoor activities. See you…. Once in a while I get a craving for Chinese food. I think we all do. And to tell you the truth I had forgotten that we do have a pretty good Chinese restaurant here in Rehoboth Beach, and within driving distance from all the beach towns. I cannot think of a reason why I have not gone lately, but I think it will be worth your while to check it out the next time you are in town. Confucius opened about 5 1/2 years ago and a lot of us, locals and natives alike were very happy to get a Chinese restaurant that would offer superior quality Chinese cooking. It did not take long for people to discover Confucius; its location is in a quaint little building on Wilmington Avenue, just a couple blocks from the Boardwalk and the beach and one street south of Rehoboth Avenue. 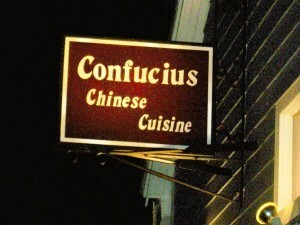 Confucius’ dishes are different from traditional Chinese menus but still authentic and creative. The address is 57 Wilmington Ave., Rehoboth Beach, DE 19971. The tel. is 302-227-3848 and the e-mail is xiongzt@comcast.net. The website is www.confuciusrehobothbeach.com. Thursday night was when my husband and I got that craving for Chinese cooking that I was talking about. As you know, in my household we have the gluten allergy issue so I proceeded to call Confucius and see if that was a restaurant that could handle such a food allergy. I was pleasantly surprised to get a positive reaction. They told me that, definitely, they could accommodate us and even though the menu would be a little bit more limited for someone with a gluten allergy, they still had plenty of dishes available; they could work and adjust the recipe. Driving to the restaurant, we noticed that downtown Rehoboth was pretty quiet for a Thursday evening. It had gotten cold in anticipation of a winter storm. But, the restaurants on Wilmington Ave. had a comfortable crowd. We brought our own wheat free soy sauce in case they did not have any. They did not carry it, but have assured us they will in the future. The breading they use in a lot of their seafood is cornmeal. So, the first thing we ordered was an appetizer called Salt & Pepper Calamari. Not the strips but wide pieces of calamari, rolled and wok fried. They were crispy and well seasoned with shredded hot pepeprs. Definitely to be ordered again. I had the pan seared salmon, which was an Atlantic salmon, lightly marinated with ginger, garlic, lemon, lime, cilantro and seasonings, served with broccoli on a bed of shredded onions, in a very hot platter. It was delicious, as well. My husband had the steamed halibut and it was steamed in a wok with ginger and scallions. Good seasonings and light. I remembered that their string beans, which are served as a side dish were so good and they were still just as good. I think they have tiny, crunchy pieces of shrimp that added to the flavor. The beans were perfectly cooked; crispy. Confucius has an extensive wine list, so for the wine aficionado, this will be a happy place to be. Then, on Friday, we went again to Confucius in anticipation of my trip to BWI, when I thought I could make it before the storm. Confucius was just as good as the night before. We had the Ginger Chicken Soup which has been on their menu since they opened and is very good. Wild mushrooms, chicken in a light broth with some lemon grass; perfect for a cold night. My husband had the Salt & Pepper Shrimp as an entree because this dish is usually an appetizer. They added more shrimp and rice and it was great. Mine was the Walnut Shrimp and Scallops with snow peapods and asparagus; very good also. Well, I think now that I have rediscovered Confucius, it will be one of those frequently visited restaurants by my family. Hours of operation are: Thursdays to Tuesdays from 5 p.m. until 10 p.m. Sundays from 11 a.m. to 10 p.m. Sunday brunch is $10/person. Wednesdays, closed. Take out is available and a 10% discount is given to each take-out order. Even though it is getting quieter than usual at my beaches, there are still plenty of things to do besides all the shopping that the area has available. Restaurants are open with all kinds of specials during the week. People are walking around all bundled up since it has gotten pretty chilly. But, it does feel great to be outside. The other night when I was coming from Ocean City to Rehoboth I could not believe that there was not a car on the road. I saw a few deer here and there, though. Tonight we went to get something to eat in Rehoboth Beach. I will tell you about it later. Afterwards we took a ride around town. 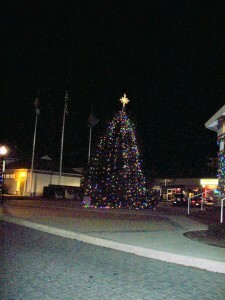 Rehoboth is all lit up and the lights give the town a peaceful glow. Even though, in the Spring, I look forward to the waking up of these beach towns and love to see the people enjoy what we sometimes take for granted, it is so nice to be downtown when the streets are bare and I don’t know how to explain it but I love it. Saturday, 12/19/09 – Race – The Seashore Strider Running Club’s 4th Seashore Snowball 5k Run. (Cape Henlopen State Park – Fishing Pier in Lewes) It starts at 10:00 a.m. For more information please contact Tim Bamforth at tim@seashorestrider.com For this particular race please visit www.seashorestriders.com. Note: Make sure you check their website since the weather is not supposed to be so great on Saturday. Saturday, 12/19/09 – A Video Art Holidays Concert & Sing Along – Meet Splash, The Solstice Dolphin and bring a non-perishable for the Food Basket. Doors open at 7:00 p.m. The location for this event is at Camp Rehoboth Auditorium, 37 Baltimore Ave., Rehoboth Beach. Please call 302-227-5620, or visit the website www.rehobothart.com. Sunday, 12/20/09 – Christmas Concert Recital at Epworth United Methodist Church, at 4:00 p.m. Christopher Berg, countertenor, will present a Christmas recital with Dough Yetter, accompanist and the Chancel Choir joining in for some Christmas favorites. For more info. please visit www.epworth-rehoboth.org. Saturday, 12/19/09 – PETCO Adoption Day – 11:00 a.m. until 5:00 p.m. Location: Ocean City Outlets, 12641-310 Ocean Gateway, Ocean City, MD 21842. Tel. 410-213-1929. Paws of Tomorrow is located in Ocean View, Delaware. It is an animal rescue organization. They are a 501c3 federally recognized animal rescue, which means that all donations are fully tax deductible. Their website is www.pawsoftomorrow.com. Their fax is 866-250-5194 and the best way to communicate with them is through their e-mail which is info@pawsoftomorrow.com. Visit their website for more information and for their mission. Paws of Tomorrow will be at this adoption event with their adoptable dogs. Please visit their website and send them a request if there is someone special you would like to meet. I know this organization. I adopted Addy last May and she has been a great dog. She feels so secured now and she is such a funny dog. She is definitely part of our family. To see the post I wrote on her on October 7th, just click on the month of October and scroll down. I know that at this time of the year, people tend to give pets as presents. Please do remember that this is a serious undertaking, so make sure you are ready to take care of the pet.